If you ever had a Takara Licca or Jenny doll with bad hair or in a frizzy tangled mess you might like to try out these quick steps to tame it. Note this may not work as well on hair that is very curly. It would be better if you don't mind the hair being straightened out after the treatment. This pretty Licca doll wasn't in that bad of a state but I didn't like how her hair ends were all over the place and well, it looks used and combed to death. 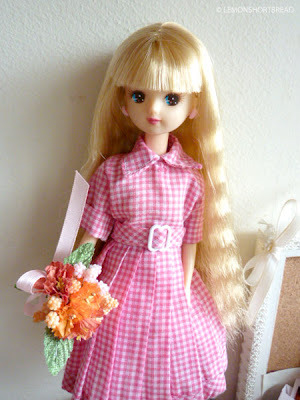 The first thing I did was to wash her hair with shampoo and condition it, no special products used. Avoid scrubbing or massaging her hair or it'll just end up more tangled, swipe the shampoo lengthwise. Rinse well, skip the hairdryer and let it air dry after drying with a towel or paper towels. While the hair was drying, I used some detangler in it. I don't recommend the one I used (Victoria Secret's one) although it is effective at removing tangles; there is an overwhelmingly strong scent in it and I didn't like it on my dolls. 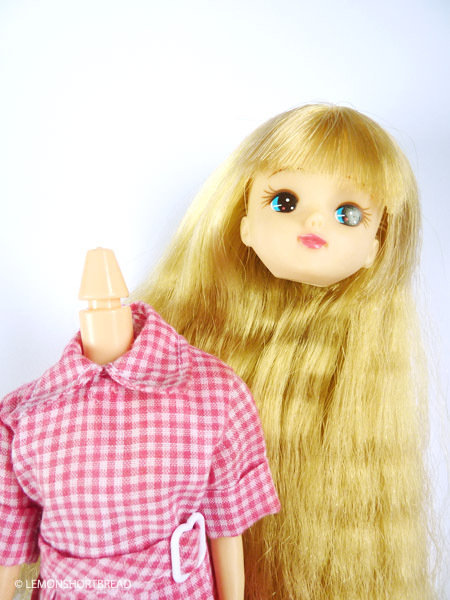 On a side note, if you wanted to know how to take Licca's head off on the non-tilting neck type, all you do is remove earrings first, squeeze her head like a pancake and pluck her head off like pinch it off to the side, try to slip it past the locking mechanism. If you are afraid that you'll break her neck by using too much strength, you can use hot water to expand the latex first then try prying it out. More details below. I popped her head back. Remove clothing and earrings. 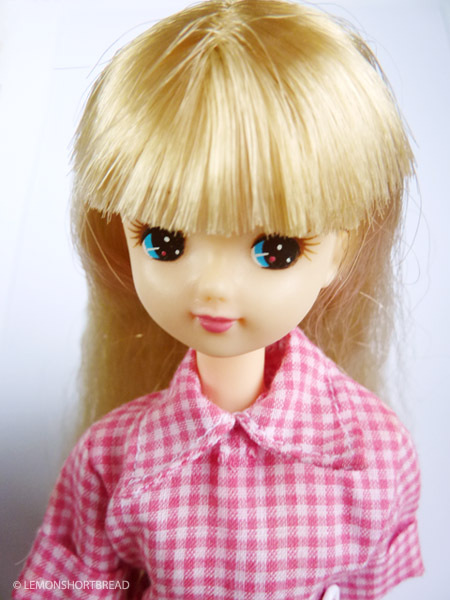 Even after fiddling with her hair for some time, it was still messy looking. If you inspect closely you would notice the filaments are 'crumpled' and not synchronising in their perm, thus giving the frizzy appearance. 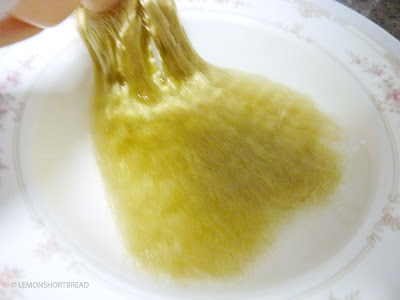 To recalibrate the fibres you can use some boiling water to soften and straightened it out. 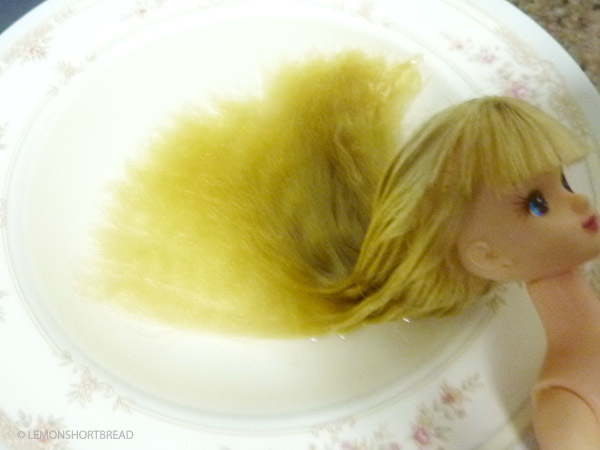 Boil the water in a kettle, lay Licca's hair on a plate, and pour the boiling water into the plate. It doesn't matter if it touches her hair while you are pouring it but watch your hands! Do not use a direct fire close to her hair or you will end up with a bald Licca with balls of hard plastic stubs as hair lol. As you can see her hair automatically finds its way. Also the original waves are not straightened out, which is fine by me, I wanted to keep it anyway. You can smell a plasticky smell when doing this treatment, at this time you can make use of the hot water to remove her head if you want to. If you don't want to wet her hair you can use a plastic bag over her head and pour it over the face to soften the latex. Watch your hands though! I let her hair air dry standing up. Did not run in cold water after the hot water. This is the next afternoon when the hair has fully dried. 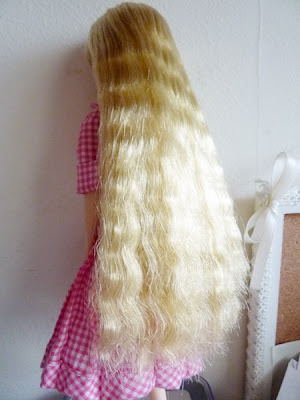 The crimped waves are neater and the ends are more defined. 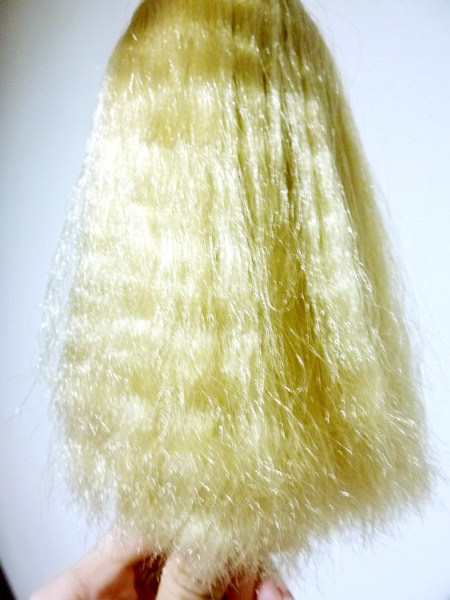 It tends to revert after some combing so you might like to do it a second time. Also the detangler I added before remained on the hair so it is quite soft. She looks happier now and ready to go!